I wanted to give you a glimpse of the ideas and feels that will shape this final installment of the Inquisitor Trilogy. Lord Pelagius travels the galaxy with faith, class and certain Terran relics to underline this. Hesperrhorods is a rare, nearly extinct flower that only grows on terra. Suspended on antigravitic vase of incredibly strong alloy and protected by the faintest glimmer of stasis. The Celeres pattern Sentinel automaton is a terran miracle and a stable workhorse of several elite Ecclesiarchy Armories. Extremely agile and able to be outfitted with Heavy Stubbers or close combat tools. 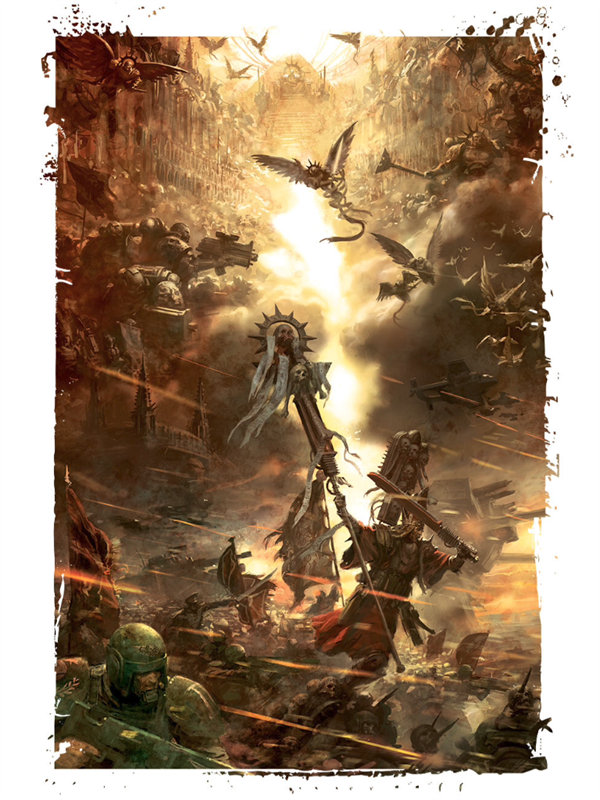 I have mentioned how gold and light and shadow will basically be the paint scheme for this entry and the perfect palette reference is attached from the cover of the 7th edition collector rulebook – beautiful handiwork of a good friend. 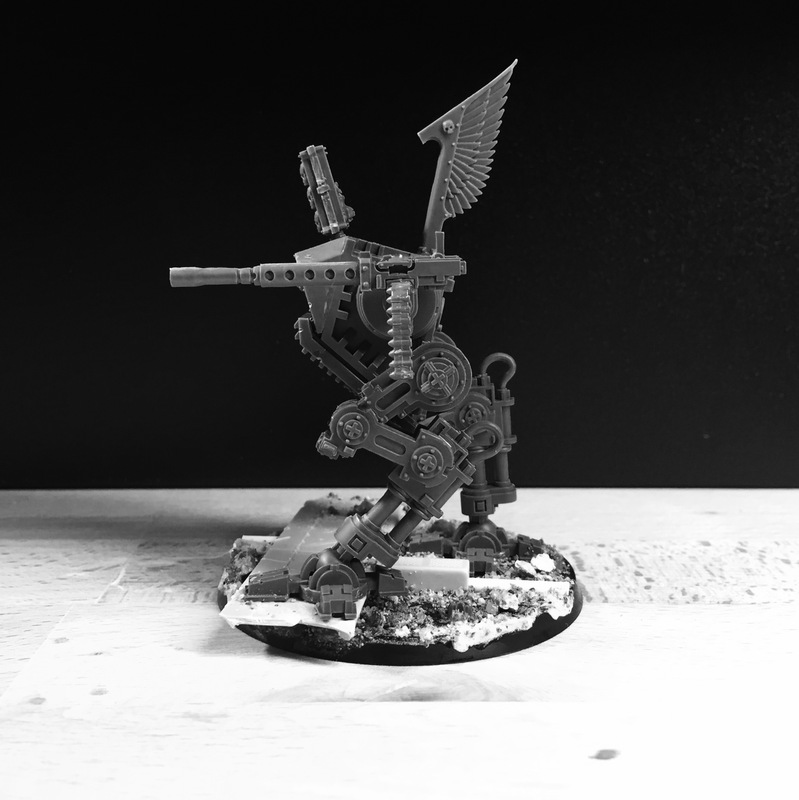 The ravenwing um…wing, ties it all together. I really like this. 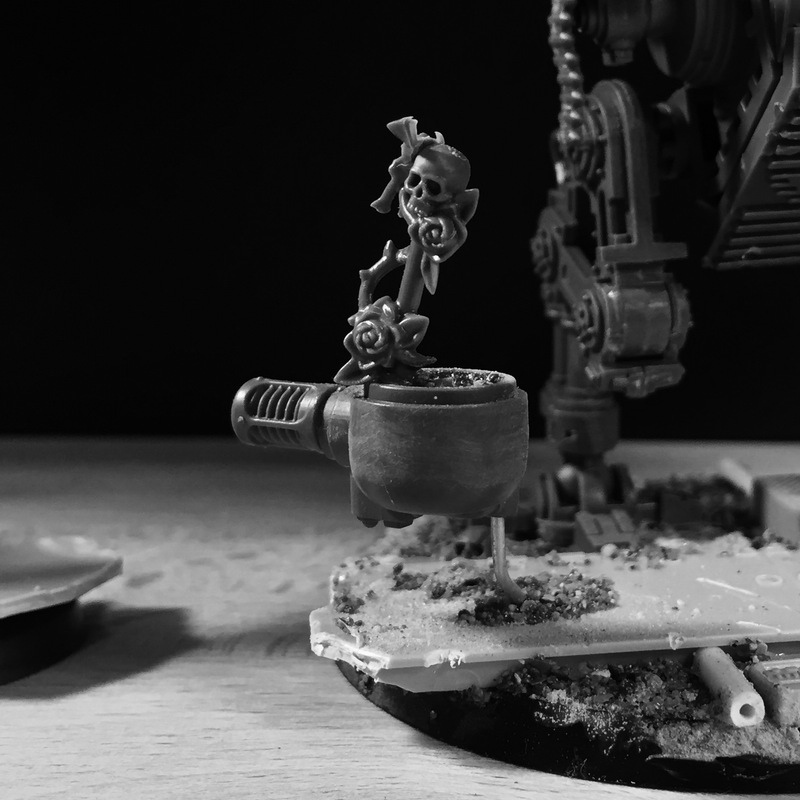 It’s things like this that take me back to my Rogue Trader days, when the 40K universe seemed like a much larger place where unorthodox designs like this would be possible. For the 60′ base, we’re all working on a walker-thing…. It starts to be more and more interesting…. I think the idea of a floating vase/status chamber for the Rose plant is really neat! You are going to have it floating on the sentinel’s base? The rose’s faithful guard? Is the sentinel a manned unit? There are not enough pictures of the chassis yet to determine that. But, I suppose more pictures will come. You used the plastic body of a dreadnought, it seems? Forgot to respond to the dreadnought question. I used the plates that the arms attach to but heavily modified them. Awesome looking progress! I always loved the Imperial Guard sentinels. Your modifications have really made it look nice and distinct (lots of clever uses of different plastic components). The heavy stubber is really cool looking too and really fits my idea of Inquisitors. I would recommend doing something about the belted ammo feed. With the length of it now it could shoot for about 5 seconds before needing a manual reload. Maybe try adding an ammo hopper? Thanks. Always been a favorite of mine too. I really went town with h this one and used parts from 5 different vehicle kits alone. And agreed on the ammo… Will have to think about that. I was just looking at the Ammo feed and thinking…..that’s not enough. Came down here only to see that you’re on it. It looks very much like a pulpit on legs from the side. Whoot!